Angtoria's debut CD has finally hit the shelves of your local store. The CD, is loaded with epic, melodic metal, built around former Cradle of Filth vocalist extraordinaire Sarah Jezebel Deva. Of course, aside from her Filthy chapter, Deva also recorded with top notch representatives of metal like Therion, Covenant and Mortiis. Now the Rehn brothers have teamed up with the charismatic Diva of metal to conquer the metallic wastelands with a fine tuned blend of melodic metal with a slightly gothic underlining. When I first got wind of this exceptional band, I was raving. Their demo CD already received my best critique and I sincerely couldn't wait until this band recorded a full-length record. “God Has a Plan For Us All” provides the answer! With no less than twelve magnificent tracks (13 on the limited edition version) the Rehn/Deva tandem shows a the world that the landscape of melodic metal is changing and Angtoria is one of the frontrunners in this process. Not only does the band succeed in creating a truly unique and dense atmosphere, they also manage to deliver a remarkable collection of perfectly balanced metal songs. Whereas the demo already stood out with a breathtaking production -- crisp and transparent without losing the immense power of their songs -- this full-length debut makes even that recording sound pale! Every single track fits this disc perfectly making it a truly joyful listening experience. The opening track, the epic “The Awakening” intro, is taunting with its sheer horror, paving the way for their first strike: the mega melodic ear mingling “I’m Calling,” to be followed by the powerful and gloomy title track. Boosted by large choirs and atmospheric dense keyboards, it bears the sign of greatness. The poppy metal song “Suicide on My Mind” and keyboard/guitar pumped “Deity of Disgust” were previously featured on the demo but have gotten an upgrade to the gold standard of this debut. Both songs sound more theatrical and stirring then ever before. Check out the amazing bridge with soaring male vocals and raging middle Eastern guitar harmonies unloading some extra power with tons of breaks and a lightning fast melodic guitar solo! “The Addiction” is one track that will certainly grow on you with every run of this silver spinner. An intimate ballad with amazing classical orchestrations and a stunning duet part, showcasing exactly why Deva is such a cheered vocalist! Her voice is crystal clear, nearly angelic, but still has enough power to blow you away. The intimacy of the epical song is so warm, it gets you looking for candles in order to dream away in the sonic landscape drawn by the angel of metal. Another former demo track is the amazingly haunted “Six Feet Under's Not Deep Enough,” with its ‘sticky’ chorus and melody, again hailing the talent of Deva and her companions. Keyboards and epic trumpets announce another gem; “Do You See Now,” a tougher nut to crack. Less recognizable than the rest, it demands more frequent play. “Original Sin” is opened by an epic intro which could have been on the last Kamelot or Epica CD; Atmospheric, haunting, loud and exceptional, breaking into a story-telling song with raving heavy guitars and pumped keyboards -- almost as if Nightwish was awoken and spiced up with tons of peppers. The mid section is a haunting experience on which the hard, roaring voice of My Dying Bride’s Aaron Stainthorpe adds some extreme power. “Hell Hath No Fury Like a Woman Scorned” again is a heavy hitter with some great percussion work and breaks. The cover of Kylie Minogue’s pop classic “Confide in Me” was a highlight on Angtoria's debut, and is boosted by the new production here. The mega melodic pop tune is transformed into an intimate metallic fortress of emotions, where Deva the angel turns into a child with a thin and fragile voice, unloading power again in the chorus and choirs. Closing the standard version of the CD is the piano ballad “That’s What the Wise Lady Said," again a moment of intimacy that colors wide views offered on Angtoria’s masterpiece. Where “The Addiction” stays floating on silently, this one builds up to a power ballad with a great guitar solo and swirling keyboards from the lightning quick Rikard Andersson of Time Requim and Space Odyssey. His mark is heard all over this stronghold of metal, and in combination with the powerful riffing and amazing drums and percussion-works of the brothers Rehn, the collaboration is nothing short of stirring. The limited edition version of the CD includes “A Child That Walks the Path of a Man” as an additional track, a song that (again) makes Deva shine like a star with her wide range. Warm and moody, showcasing the excellent skills of the band, and closing the tracklist of one of the finest releases of this year. When I originally wrote the review of Angtoria's demo, I predicted this band would score a deal sooner rather than later and, man, was I right! Listenable Records offered the deserved deal and signed one of the hottest new acts in melodic metal. The amazing compositions and epic, atmospheric musical claw here grabs your throat with surgical precision and has no intention of letting go. Angtoria is explosive like Nightwish in their best days, but more powerful and precise without ever overdoing things and losing sight of their intentions. And, on top of all this, the fine musicianship of the Rehn Bros. and the unforgettable voice of Deva. “God Has a Plan For Us All” also features a fine list of guest musicians, including members of Cradle of Filth and My Dying Bride, to name just two! While the cover art and song titles may not be exactly what you'd expect with a melodic and epic metal act, you simply cannot pass up this magnificent piece of work. Forget the cover and let the music convince you! For more information, check out http://www.angtoria.com. Angtoria's demo is a 5-track CD packed with melodic metal built around the crystal clear voice of Sarah Jezebel Deva, who has performed with Cradle of Filth, Therion, Covenant and Mortiis. I know what you're thinking: Does this CD sound like you'd expect it to sound? Not at all! Instead, the music of Angtoria is very melodic metal with touches of Gothic and a slightly progressive undertone. It’s a thrill and all sounds very fresh! 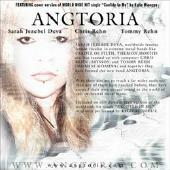 Angtoria also features the Rehn brothers, Chris (Abyssos) and Tommy (Moahni Moahna). They have succeeded in their task to stand out and avoid being captured in the traps of modern day music. They went around the obvious and have created a truly unique sound in which Sarah can showcase her excellent voice. Guitars are tuned in fine harmony with a massive wall of keyboards, and drums and bass provide a heavy, solid foundation. I still haven’t figured out exactly what it is that makes Angtoria stand out so much with all the other acts out there ... they simply have that 'magic.' Remember when you first heard Queensryche? The sound here reminds me of a bombastic version of Nightwish, with a much wider voice, like Floor Jansen of After Forever (but I don't want to label Angtoria, which would not do justice to this band!). The opening track, "Six Feet Under's Not Deep Enough," sets the tone and is a driven heavy track with pianos in the background, adding extra depth. The bridge and chorus click instantly here. The following is a cover version of "Confide In Me" which is brought vividly to life with keys and guitars in close harmony. The energy here truly adds a lot of fuel to the fire, especially when I thought I would never like this song! Angtoria proves me wrong on all counts! "Suicide On My Mind" is a moody melodic rocker. Slowly unfolding toward the end, it has (again) a very recognizable bridge and chorus. All of the previous tracks pave the road for a true masterpiece: "Deity of Disgust." A heavy track with a lot of progressive and modern touches to it, "Deity" is heavily orchestrated by keys in the most magnificent and explosive Nightwish tradition. But while the Finnish Gothic act tends to fall into repeating themselves over and over, Angtoria twists and bends into a pure melodic metal form. When I played this track for a friend, he mentioned Nightwish blended with House of Lords and Dio! He doesn't know how close he was to the very being of it! The chorus here is marvelous and, indeed, reminds us of Dio in duet with Tori Amos and Kate Bush ... on acid! "A Child That Walks in the Path of the Man" wraps up this five track disc. A moody and warm track again, wisely, with a spotlight on the wide range and crystal clear voice of Sarah Jezebel Deva. The production by Chris Rehn is crystal clear and very sharp. The instrumentation and orchestration is excellent as is the craftsmanship. This demo will surely result in a record deal! It has to! This CD was voted 'demo of the month' by Metal Hammer and I'm giving it three and a half guitarsaws here. The only thing keeping it from being perfect is the fact that it's only got five tracks. I want more. Now! Make sure to visit www.angtoria.com for the latest info on this remarkable band.